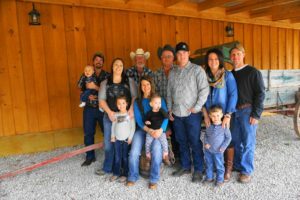 Three generation of Howells, Robert Howell, Brett & Lisa and their children, Vanessa, Landon and Taylor. The family has doubled in size by adding Vanessa’s husband Kevin and son Blake and Landon’s wife Sara and children Annabelle, Charlie, and Royce. Come & enjoy the beautiful scenery along Big Creek and Current River. You’ll enjoy a friendly family atmosphere at Big Creek Trail Ride. Our first spring trail ride of the 2019 season is March 31-April 6 so get your reservations in for a year of wonderful trail rides and good old fashioned down-home country fun. We offer some of your best vacation bang for your buck and in these times everyone is looking to get the best deal for their dollars. We look forward to serving you and your family, to bring you some of the most memorable and relaxing enjoyment that you can have.